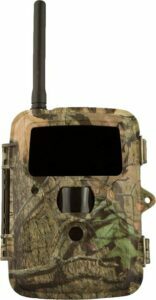 Covert Special Ops Code Black 3G cellular trail camera is perfectly suited for those who want to immediately receive copies of the photos even while they are away from their homes or their cameras. This trail camera is able to send photos to your smartphones through texts or emails to you. Now, you no longer have to pull out the SD card to be able to see the pictures. This camera is very ideal to use for security and surveillance purposes since you are still able to know what is going on in your premises even if you are not around. It is very reliable as it sends out photos every 60 seconds, keeping you updated despite your absence. The Covert Special Ops Code Black cellular trail camera is very light, making it easier to transport from one location to another. The storage will not be a problem too as it has a 32GB SD card that allows you to store hundreds of photos. This excellent trail camera works with a GSM sim card, like AT&T and T-Mobile. However, it is not compatible with Sprint, Verizon or any other non-GSM carrier. It also needs to be properly set-up in order to have a successful cellular transmission of the photos. The battery life of this camera is also good enough that you can take 3000 photos on each set of batteries. It has a flash range of 60 ft. along with a 60 invisible flash LED. This makes it an excellent tool to take stealth photos of wildlife. There are, however, a few setbacks with this camera. Daytime photos may come out dark and blurry due to shadows especially if the camera is place under a canopy. It may also have some poor reception at times, making it difficult to send out the photos. There are also times when the camera hangs and stops taking pictures. Some users have also mentioned that the external antenna doesn’t always boost the camera’s reception as much as they would like. Despite these, the Code Black 3G is one of the best game camera options, and is still a better model than many others as it has a wide variety of features and it is functional for surveillance and security. All in all, it is one of the best cellular cameras available in the market.